Japan has successfully landed two small robotic rovers on the asteroid Ryugu. The tiny body is currently located some 186 million miles (300 million kilometers) away from Earth. The duo was released from Japan’s Hayabusa 2 spacecraft orbiting the asteroid on Friday, September 21 and a confirmation of the successful landing came one day later. The two tiny rovers, designated Rover-1A and Rover-1B, are part of the second MIcro Nano Experimental Robot Vehicle for Asteroid (MINERVA-II) project. They were deployed from Hayabusa 2’s MINERVA-II-1 container at about 00:06 EDT, September 21 at an altitude of approximately 180 feet (55 meters) above Ryugu. On Saturday, Japan Aerospace Exploration Agency (JAXA) confirmed that they landed on the asteroid’s surface and are transmitting data. The agency also released the first images captured by the rovers during the landing. 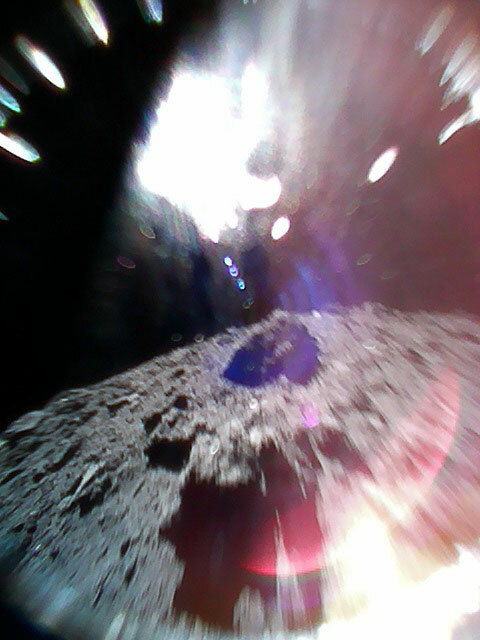 The achievement marks the first time when rovers capable of maneuvering around the surface of a body, especially one as small as Ryugu, have been successfully placed on an asteroid. “I cannot find words to express how happy I am that we were able to realize mobile exploration on the surface of an asteroid. I am proud that Hayabusa 2 was able to contribute to the creation of this technology for a new method of space exploration by surface movement on small bodies,” said Yuichi Tsuda, Hayabusa 2 Project Manager. Due to the asteroid’s weak gravitational pull, the rovers dropped slowly to the surface as there was a risk that they could float off into space if they landed hard. After touching down, the small robotic explorers started hopping and floating around to collect images and data. The two cylinder-shaped rovers measure some 7.1 inches (18 centimeters) in diameter, 2.75 inches (7 centimeters) in height, and weigh in at around 2.42 lbs. (1.1 kilograms) each. Rover-1A is equipped with four cameras, while Rover-1B has three cameras on board. MINERVA-II is the successor of the MINERVA rover installed in the Hayabusa spacecraft that landed on asteroid Itokawa in November of 2005 and returned a sample of material from it to Earth. Although Hayabusa managed to land on the asteroid, MINERVA failed to reach the surface. “I was so moved to see these small rovers successfully explore an asteroid surface because we could not achieve this at the time of Hayabusa, 13 years ago. I was particularly impressed with the images taken from close range on the asteroid surface,” said Makoto Yoshikawa, Hayabusa 2 Project Mission Manager. Weighing some 0.6 metric tons, the Hayabusa 2 spacecraft was launched on December 3, 2014 by JAXA on a mission to explore Ryugu, retrieve materials from it and bring them to Earth. It arrived at Ryugu on June 27, 2018 and is scheduled to depart from the asteroid in December of next year (2019) in order to return home the following year. Ryugu in an Apollo-type potentially hazardous asteroid (PHA), with a diameter of around 0.6 miles (1 kilometer). Study of this asteroid could be important for planetary researchers as it may contain organic matter and water. If everything goes according to plan, Hayabusa 2 will also deploy the Mobile Asteroid Surface Scout (MASCOT) lander developed by the German Aerospace Center (DLR) on October 3, 2018 and Rover-2 in 2019, which is similar in size and design to the duo of rovers already on the asteroid’s surface.